Was going to suggest this. Thanks! This sounds great. Thanks for all your hard work on this. The thing is I can't figure out how to switch which build I'm working on. In reality most custom parts would probably be related to custom water cooling and sub ambient CPU cooling. It would be grerat if we could just go through and select Pump, Reservoir, etc. like everything else. That makes sense - I can certainly look into that. Or maybe something like default filter settings, perhaps? Ability to choose nationality in User Preferences. I will definitely look into that. Thanks! On the top right (drop down box) you can choose country. . . . I wish I could have it in the profile, so that I don't have to switch the country every time. It's not a major hassle, but it becomes annoying whenever I get a few minutes in and realize that I've forgotten and that all the price and availability data I've found is not applicable. Awesome updates! I continue to use this site for every build I make! Keep it up! Would it be possible to send a couple stickers to me for my own builds? Bought 3x of the little stickers and 1 big one for some of the builds I've done for my friends. I know a little bit about Charity:Water (I think possibly from a TED video) so I don't mind losing $2.50. Awesome! Thanks! I'll make sure those get sent out tomorrow (Monday). I didn't realize this earlier. 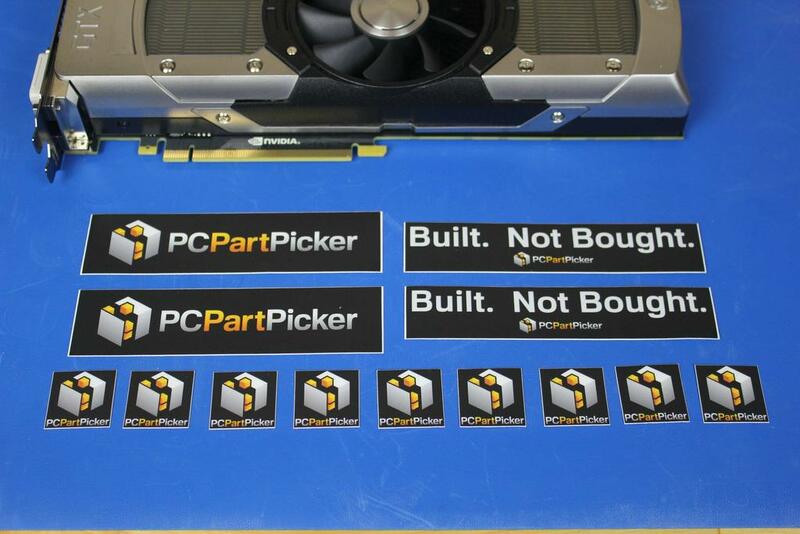 but why do the "PC Part Picker" large stickers not appear in the store? Only the small 1x1 and the "Built. Not Bought" stickers are there. Nvm, didn't realize there was a Catalog. They're in there - just not on the front page. If you click on the "catalog" link, it'll show everything. (Or just follow this link). If you add a filter for price - check boxes and or a slider (like newegg uses). The "80+ Certified" option would be nice, as when I build systems I never choose anything not 80+. The price slider would be neat too, kind of a modified version of the checkboxes consolidated into one bar. The slider makes sense for all continuous data (size, price, clock, timing etc). Because I'm usually not looking e.g. 1333Mhz CAS9 RAM, instead I'm looking for RAM that's at least 1333 Mhz and at most CAS 9. Just finished ordering all the parts including several mail-in rebates I would not have known about without PCPartPicker. Overall, this site has saved me over $100 on a $900 build. You are a very good hard working dedicated man, i appreciate all of this! Yeah, the features keep rolling out. Its really cool to see it unfold. Hmmm, I could have sworn I added some 4TB drives. I'll take a look and see what's going on there. For the price drop email, I could definitely do that. There's a few other tweaks to it that I want to do, so that could fit right in. I wanted to let you know that the ability to save notes to a saved build is now available. Took me longer than I hoped, but the new feature is live. I'd like to see some flag that I could check to show parts that I have ordered. I ordered parts over a month long period and simply copied my parts to a new build and removed each as I ordered it - this worked fine but it would have been nice to show otherwise. Thanks again for such a great resource. There should be an option to ignore the price of certain parts. I like to add things like my OS for completeness but not have the price factored into the final result. Can provide a link to do this. I suppose the current method isn't obvious - if you click on an unread message, it will change color (from highlighted blue) to white and mark it as read. I can certainly add a link to do this (and all at once) however. Thanks for letting me know (and the browser version - that's very helpful!) -- I'll see if I can get it fixed up. Nothing about sound cards / sound parts? Sound used to be optional on early computers, so wouldn't it be critical nowadays? I'll still keep checking back, but the sooner the better. Check back sooner rather than later... :) Sound cards are in the pipeline. FYI, I just added sound card support. Speakers/headphones still on the roadmap. Awesome, man! I'll keep my end of the promise to buy some of your merchandise. When searching memory: being able to filter/organize by module size, instead of total size. You can do this indirectly by choosing both the total size and the # of modules. So if you want 2 modules totalling 8, it'll automatically give you a 2 pack of 4GB each. Yes, but it would filter out some 1 x 4 GB that might be better fits. I love the new features! There is one bug though, well not really a bug but an easily misunderstood feature. When I "view builds", I see the "copy to a new build" buttons but I don't see a button for "start a new build from scratch". I had gotten used to using "remove all" as my "new build" button, back when you had to save a new build after every change. So now if I go to the "System build" tab and "remove all", it actually deletes whatever build I was last working on. I actually accidentally deleted a build this way(**edit: I should clarify that I did not save the changes, but they were still made permanent anyway)! Maybe an "Are you sure?" page would be useful, or you could eliminate the "remove all" button and replace it with two buttons named "Start new build" and "delete current build". Or something like that. Unfortunately I didn't make it very obvious - there's now a selector to choose which build you're currently working on. I'm sorry you ended up deleting all the parts out of a saved build - I can imagine that would be frustrating. I'm working on improving the usability of that whole aspect to make it more intuitive, and will definitely look into adding a "new build" button as well as a confirmation when about to delete everything. It's okay, I had most of the parts in my history so I was able to redo it quickly. I know you're getting tons of suggestions so I hope it isn't too much pressure! This is (as far as I know) the only site of its kind but I'm glad that it is also likely to remain the best. Is there a forum anywhere on the site? From what I've seen, comments can only be made on builds and blog posts. A forum would be a cool addition if it isn't already somewhere on here. (even though most of use probably go to r/buildapc anyway. LOL) One minor bug I just found: In the inbox, "Deleted" comments still show up as unread. There isn't a forum yet, but that's something I'm considering. Hey Philip, is there a way to report dead/inaccurate links? For example this is out of stock at the cheapest price and this is a Kobe Bryant USB key. Also I just realized that every comment I've made thus far has been a criticism. I just want to say that your site is fantastic and is my primary resource for research on available parts. Thanks again for your work. At the moment the best way is via the contact form. I know that's pretty tedious though, so I'll look into adding a "report this price" type link/button/something-or-other. Thanks for letting me know about those two. The USB key... wow. That has been removed. And I definitely appreciate your feedback, good and bad. I'm glad you find the site useful! Both positive and negative feedback helps me improve on it, so I'm always here and listening. Is it possible to send someone a private message on here? I have a suggestion. There seem to be a lot of users who publish desired builds or wanted builds, and these are all mixed up with completed builds. I think it would do all a service if completed builds were on one page and desired/wanted builds on another. Then the noobs and people building now can look to completed rigs for ideas and the experienced guys can pitch in and help the noobs pick parts. Why is my completed build not showing up in the filter browsing function? i think that a great feature would be price range. when i am looking for something i always have a price range(cases $20-$60). so adding that feature would save us a lot of time. ps. this is a great web, very helpful. Can you mail your own pc list? i made a pc and want to send it to my dad. Thanks!